Here is the next in the Crockpot Cooking 101 Series. These are some great General Crockpot Cooking Tips. How much should I fill my SlowCooker? A Slow Cooker should be at least ½ full to ¾ full for best results. Do I need to pre-brown my meat? The answer is no. You don’t have to. However, if you choose to it will eliminate some fat from your recipe, and add to the flavor of the dish. Can I add Frozen Meat to the Crockpot? Yes, you can add frozen ingredients and meat to the crockpot. You will want to increase the cooking times accordingly. Typically by atleast 2 hours. Below is a conversion chart if you need to change a recipe from “High” to “Low” and visa versa. 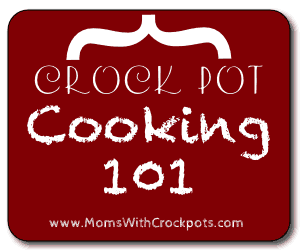 Don’t miss the other Crockpot Cooking 101 Posts!